Once you figured out what pages you want, it's time to implement it in Rails. Since we're creating a completely new group of pages, the first step is to create a new controller. We're going to display products, so let's call our controller ProductsController. Previously we created custom routes individually, but Rails provides standard shortcuts to create common URL patterns. 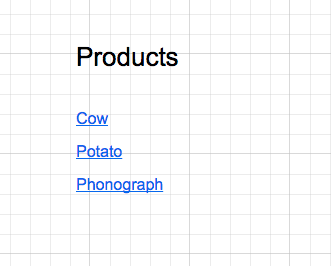 Currently, we want to create show and index pages for products, but these kinds of pages could be used for other models also, such as Categories or Users. Since pages like show and index appear so often, Rails provides a standard resources way for creating their routes. A resource is an item which has standard URLs for performing standard CRUD operations. Rails lets us declare these standard URLs in the routes file with the keyword resources. Before we do this, let's check what routes currently exist in our application.